Lan Tung inhabits a space of paradox: as a soloist and collaborator, a performer and composer, she sits at the crossroads between the East and the West, innovation and tradition. No wonder she founded an ensemble named Birds of Paradox. That particular project brings together Indian, Celtic and Chinese musical influences, but her many other projects—the JUNO-nominated Orchid Ensemble, the Vancouver Inter-Cultural Orchestra, and Tandava being the main ones—are no less melting pots of style. 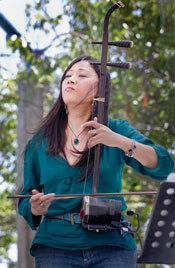 Taiwanese-born erhu player Tung is based in Vancouver, but her playing takes her on extensive, diverse tours. Often, she’s soloing with an orchestra one week and playing for a visual arts/media or dance performance the next. In between gigs she studies fiddle-instruments around the globe with players of all stripes—from the erhu, with principal players in China, Taiwan, Canada and the U.S. to improvisation with violinist Mary Oliver in Amsterdam, Hindustani classical music with Kala Ramnath in Bombay, Egyptian music and maqam with Dr. Alfred Gamil in Cairo, graphic scores and improvisation with Barry Guy in Switzerland, and vocal music and music therapy, to boot. Her projects straddle world, new, chamber, orchestral, and multidisciplinary music. The myriad influences show up in her compositions and improvisations. The erhu is commonly described as a Chinese violin. It’s a useful point of comparison: they’re both wooden stringed instruments in the soprano voice range—the erhu with a smaller two and a half octave range—played with a horse-hair strung bow. But the erhu is held vertically on the player’s lap and the bow is placed between the two—instead of four—strings. You put rosin on both sides of the bow and one side plays one string and the other, the second. The underhand bow hold is more similar to a double bass German bow hold than the one used for violin—similar to the way you hold chopsticks. There is no fingerboard: fingers press against the strings suspended over, instead of on, the wood. All this means the erhu can be played longer with less fatigue; pitch can be manipulated not only by moving up and down the fingerboard but also by varying the pressure on the strings, allowing for a second style of vibrato. Of course, there are differences between the prototypical erhu instruments and the standard classical erhu—there are over 50 variations of related folk instruments from China. The strings were traditionally made of silk but are now commonly made of steel; Beijing opera instruments were made of bamboo, southern ones of coconut.